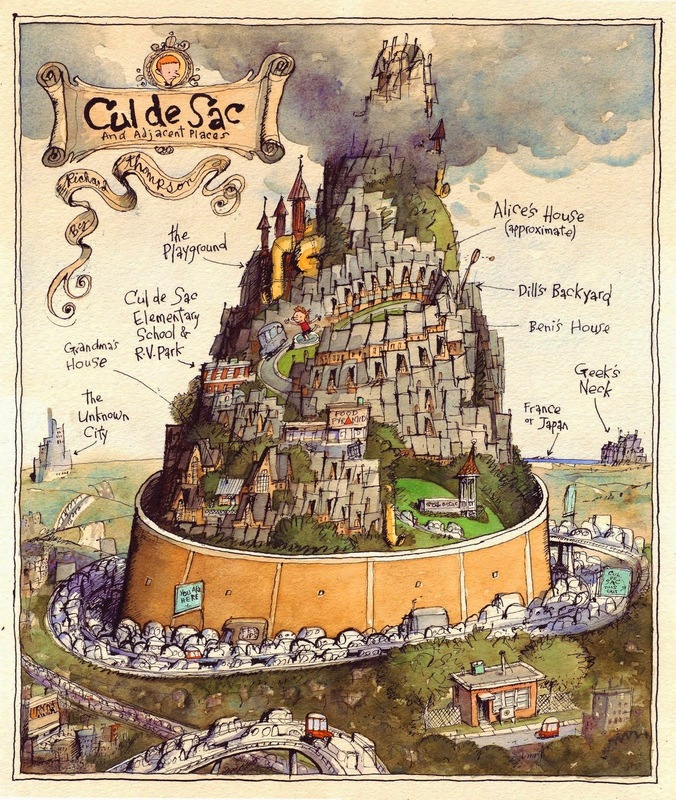 Uh-oh, the weeks have flown by and once again the supposed purpose of this blog (to force people to read Cul del Sac) has been ignored. Rutherford B. Hayes has long had a vital place in the life of America's children. Just look at the following Almanac from the early 2000s (which is at least somewhat historically accurate). 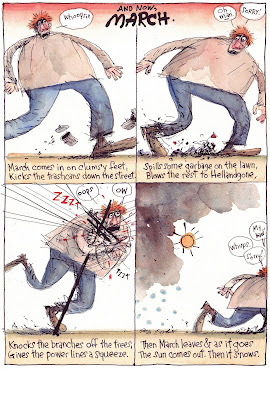 So really it's hard to justify Petey's aversion to Hayes in the following strips. The fun part of this for me was putting in Petey's little under-table gestures. I had originally planned another shoebox diorama, but c'mon, it's getting a little old. The third panel above was taken from some of my favorite Ah-ha moments in various movies, where someone gives the protagonist an unwitting insight and he gets to say all that "I could kiss you" stuff. The B. stands for Beard; most people, especially historians, don't know this. Someone pointed out that there has been an actual pop-up comic book. However, until I'm told otherwise, I claim this as the first pop-op comic strip. Even though it doesn't really pop-op. And I claim this as the second. On the other hand, I hope some kid somewhere has done this. When I was in lower grade school all the music appreciation stuff we got dealt with the stories music told. It's a hard habit to shake. I've been trying to find a role for Loris as she's kind of an untethered character. Maybe she needs her own Sunday strip, like Roscoe Sweeny was Buz Sawyer's comic-relief friend who took over the Sunday page duties. Clowns again. Clowns are comedy gold, but not the way they intend to be. The ceiling in panel two was fun to draw, the crowd scene in panel three less so. This is because I forgot to draw a Valentines Day strip. It was overcome by Rutherford B. Hayes. This was an excuse to draw in a childlike style. The punchline came much later. A drawing fight does sound like fun, but then I played Pictionary recently and got creamed. 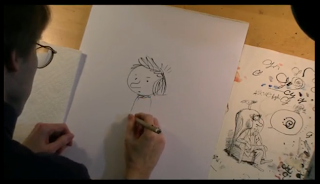 The rough below is the one the NYer chose, and this is the rough sketch for the rough sketch. It's gotten to the point that I have an old blog post that's appropriate for any event, however obscure or unworthy of attention. So all I have to do is figure out a post-generating algorithm, set it on automatic, and this blog'll run itself. 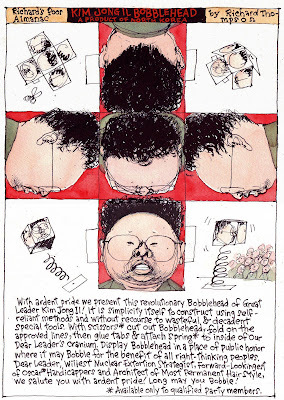 And here Kim Jong Il looks at things. If I had any brains I'd turn this into a Valentine's Day card. 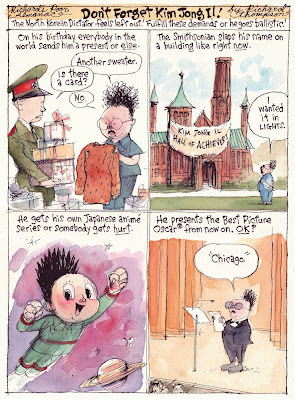 It was drawn to illustrate a Joel Achenbach column in the Post Magazine five or six years ago, though I don't know why. Something about Valentine's Day I guess. I just like the idea that the poor woman has likely been standing there for days waiting for the guy to finish her surprise. That and she's going to be stuck with a giant, chalky pink heart thing when what she wants is chocolate (see previous post). From a 2009 Poor Almanac. Or maybe it was 2008. 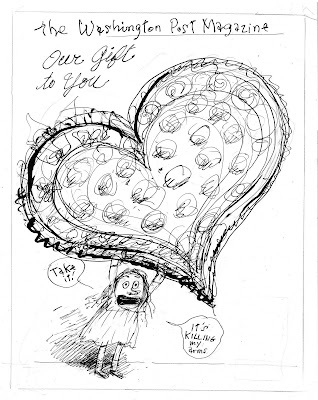 Cul de Sac is now seven years old, having launched in the Washington Post Magazine in its 2004 Valentine's Day issue.Above is the first sketch and the drawing used on the Post Mag cover the week it debuted. Originally it was going to be on the plastic bag holding the paper too, but that didn't happen. Which is a relief, as it might've scared away Post readers and depressed sales. Let's see if I can remember what happened this week. Oomaboogy Wow Wow is the closest I could come to Yo Gabba Gabba, the mildly insane, acid-trip show for young children that my older, high-school-size daughter watches. She also likes the Upside Down Show. I'm still stuck on Captain Kangaroo and I'll imitate the Banana Man anytime and anywhere whether anyone gets it or not. I don't know how the Oomaboogy theme goes and I don't think I want to know. Someone wisely pointed out that this replicates the common horror movie situation where someone is shown alone in a wide shot, then in a close up shot a hand comes out of nowhere to tap them on the shoulder. It's a cheap trick but effective. I just realized that there's another strip coming up where Petey ends up with a bandaged nose. Sounds like a theme best left unexplored. Is there any doubt that things would turn out like this? Petey's not real involved with toys. This started out as a stray thought that Petey would likely only have one plastic army man. What can you do with one plastic army man? Not much, except maybe pretend he's one of those soldiers lost in a jungle who still thinks World War II is going on. I'd already mentioned Mr. Uggins, the Jarred Bear, so I just had to fill out Petey's catalog of toys a little and boom, there's a Sunday strip. 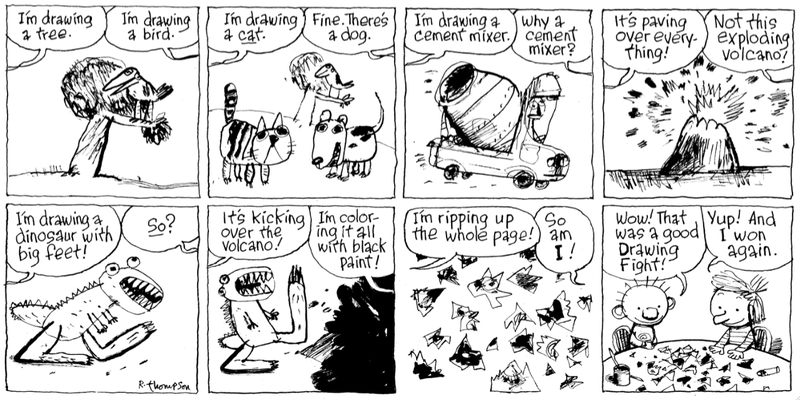 Something I've noticed talking to people who read Cul de Sac: they say, "I really like Alice, but I'm more like Petey." Believe me, I know how you feel. 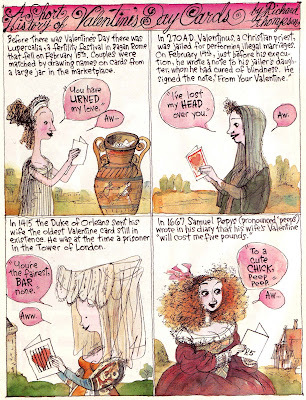 This is from the Post mag, Valentine's Day '03, and it's another lazy repost. And every word of it is true. I was shocked to find out that my editor didn't know that diarist Samuel Pepys' name is pronounced "Peeps", especially as I'd only learned it the day before. I always thought it was Pep-eez, which is actually a stomach antacid. My friends Kevin Rechin and Nick Galifianakis, along with their intern Brent Nieder, have just launched an animations website called Chirptoons. It's very funny. This ran on January 2, 2005 and it illustrates a pretty common DC phenomenon: the First Snow Panic of the Year. By now we're safely past it and into the fourth or fifth of the year. One thing I notice in this is a somewhat flatter, scratchier style. And Dill's ears stick out of his hat. 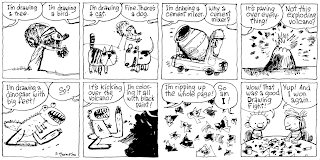 This is your weekly reminder that Team Cul de Sac would love for all you professional cartoonists, illustrators, animators or drawers to create an original drawing that mocks, celebrates or vaguely refers to any or all of the Cul de Sac characters. Why? To raise funds for the Michael J. Fox Foundation for Parkinson's research, of course!. Chris Sparks, the man responsible for Team Cul de Sac, would love to hear from you and so would I! 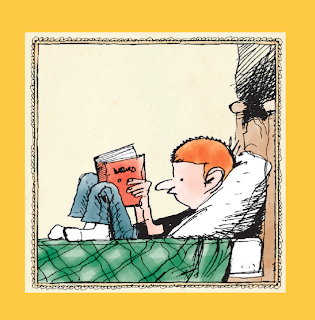 And for those of you wishing to donate to Team Cul de Sac and who are not cartoonists, please see here. How quickly the week slips by when you're having so much fun. 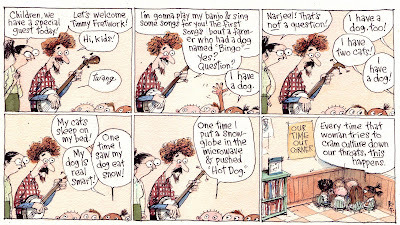 To begin, here's Timmy Fretwork's first appearance from an October '04 Post Magazine, which I redrew three years later for the syndicated strip. 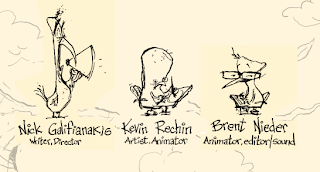 Mr. Fretwork is based on about five real people. Ha! Kids say the most awkward things! And they keep on doing it once they're adults. They're also impressed by all the wrong things, and ditto. I like the sootis so much I'm going to refer to them every chance I get. At least until some major studio latches onto them for a crowd-pleasing 3-D movie. I'd've liked to've heard that Snowpile song. I imagine it would've gone something like, "Snowpile, snowpile, Watch it grow, Snowpile, snowpile, Lots of snow!" Sung to Freight Train, of course. The hand sanitizer thing was pulled from real life, except for the part about it being arisanal and mole-scented. This opens up all kinds of possibilities, maybe. There've been a few instances of Ernesto interacting with people other than Petey, which seems to point to his being a mass hallucination. Because no way can he be real.